Soya chunks are known by many names like soya nuggets or mealmaker or nutri nuggets by the brand name "Nutrela" who sells Soya nuggets. They are full of nutrients and highly beneficial. They are high in protein, iron, fiber, Vitamins and minerals like manganese and copper. Soya bean is one of the best non-fish sources of essential omega-3 fatty acids, that can help in reducing the risk of coronary heart disease. Soya is such food item, which is good especially for diabetics and heart patients. It is one of the best source of protein for vegetarian people in India. Nowadays, Nutrela makes soya chunks in different sizes for making various recipes. 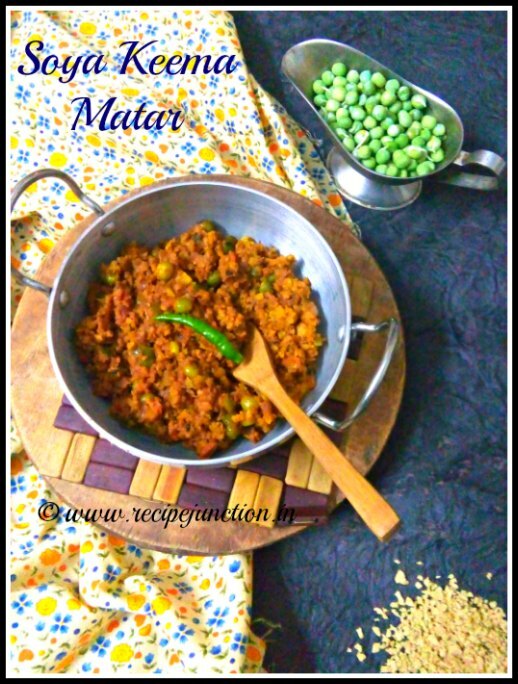 I got a box of Nutrela Soya granules(very tiny granules of soua nuggets) and while thinking what I can make with it, decided to make a Vegetarian keema Matar with it as the soya granules totally resembled with the chicken keema. And needless to say, it tasted delicious. Soya chunks need to boil before using, you just need to boil it for few minutes in sufficient amount of water with a pinch of salt until they become soft and fluffy. Heat water in a pan. Put soya granules in it for 4-5 mins. Once it fluffs up, remove from heat, let it sit in warm water for another 5 mins. Then drain and keep aside. When it cools, squeeze out the water and keep aside. Heat oil in a pan. Add bay leaf, cinnamon, cloves and cumin seeds. Let the cumin splutter. Then add the chopped onions and green chillies. Saute till it turns soft. Then add ginger-garlic paste and stir for few more minutes till it turns brown. Now add tomato puree and all the spices, except garam masala. Saute till spices blend well with tomato puree. Add green peas, the soya granules and salt. Mix well and add about 2/3 cup of water and cover with a lid, leaving them soak the spices for sometime in medium-high heat. Lastly add garam masala and mix well. Remove from heat when all water evaporates. 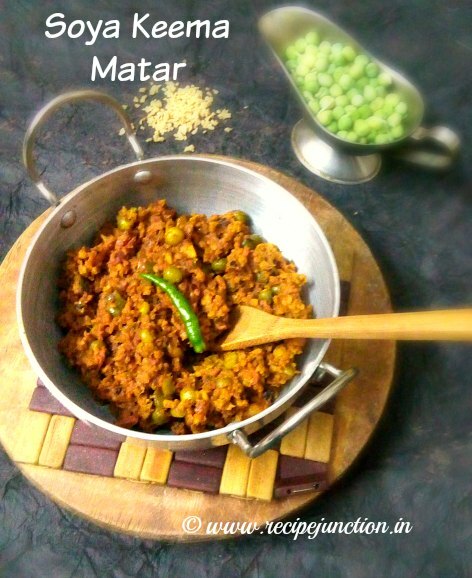 Garnish with chopped coriander leaves and serve hot with roti(chapati), naan or parathas.